Django Unchained is a stunner. I never thought I would say that a Quentin Tarantino film is almost as good as his piece de resistance Pulp Fiction, but this one comes close. Much like Pulp Fiction, this movie is not so much about the plot but rather about the dialogue that drives the masterful suspense and the scene after scene of purely tantalizing cinematography and episodic brilliance. Chapter after chapter roll past and the viewer rarely wants the scene to end, but it always does, and Tarantino always leaves us wanting more. Even the most graphically violent scenes never overstay their welcome, which helps make them so enjoyable and some of them even downright hilarious (like when the southern lady gets swooped off her feet and out of the room by one of Django's righteous bullets). Christoph Waltz, who was so captivating in Inglourious Basterds at "The Jew Hunter," is flat-out the actor of the year in this one. Forget Daniel Day Lewis in Lincoln. It's pretty safe to say that Waltz is the top master at delivering Tarantino's also award-deserving scriptwriting lines. 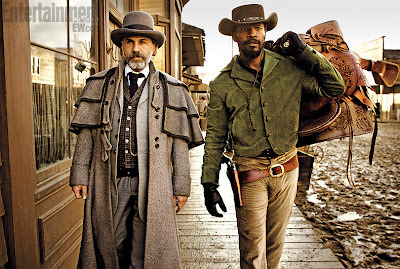 This is my movie of the year, and the second-best Tarantino movie ever.